Despite media claims of a revolutionary change, Pope Benedict is not altering Catholic teaching on condom use or justifying the disordered use of sexuality, Vatican spokesman Fr. Federico Lombardi has explained. In these comments “the Pope is not reforming or changing the teaching of the Church but he reaffirms it, putting it in the perspective of the value and dignity of human sexuality as an expression of love and responsibility,” the spokesman said. In Seewald’s book, Pope Benedict says that the Church “of course” does not regard condom use as “a real or moral solution” to the problem of AIDS. According to Fr. Lombardi, his treatment of the topic considers an “exceptional situation” in which a sexual act presents a true risk for another’s life. In a short passage at the end of the tenth chapter of Seewald’s book, the Pope discusses the “banalization of sexuality,” which treats sexuality as a drug. The pontiff uses the example of a prostitute. “In such a case, the Pope does not morally justify the disordered exercise of sexuality,” the spokesman explained. Rather, the use of the condom to lessen the danger of contagion may be “a first act of responsibility” and “a first step on the path toward a more human sexuality” rather than acting to put another’s life at risk. “In this, the reasoning of the Pope certainly cannot be defined as a revolutionary turning point,” Fr. 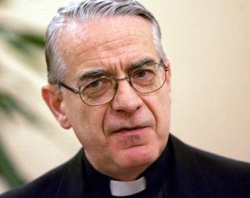 Lombardi said, following worldwide media reports of a change in Church teaching on contraception. Fr. Lombardi repeated Pope Benedict’s view that concentrating solely on the condom trivializes sexuality. This obscures its meaning as an expression of love between people and makes it become like a drug. Fighting against this banalization preserves sexuality's positive value and helps it to have a positive effect on “the whole of man’s being,” Pope Benedict says in Seewald’s book.